Website design for HOA Homeowners Associations – This new custom Word Press site featuring home owner login and registrations. There are private pages for HOA minutes and documents. This HOA website is an original custom Word Press design. The website features an interactive calendar that syncs with Google and Outlook calendar systems. 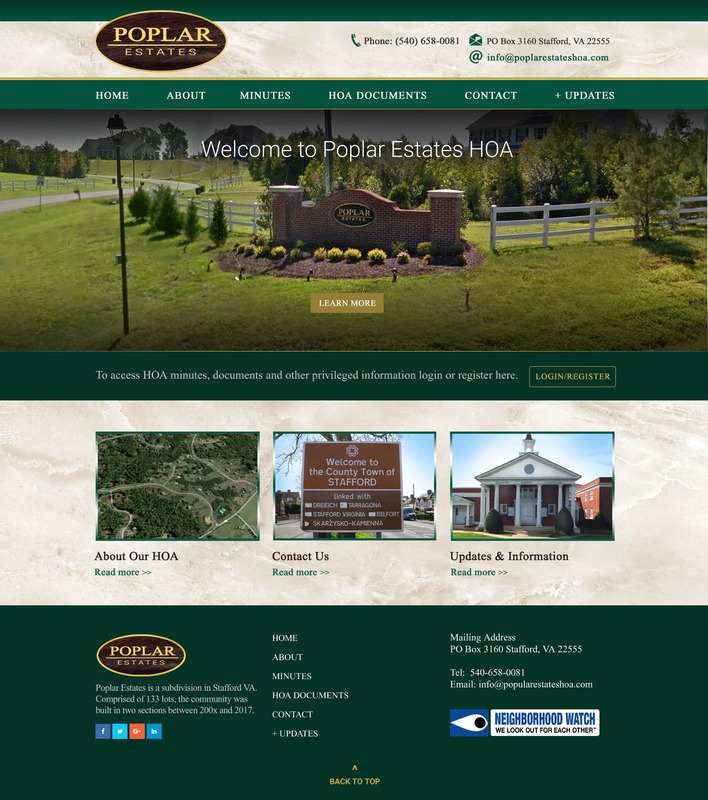 Poplar Estates has offices in Stafford VA. Searching ‘Website design for HOA Homeowners Association’ find VISIONEFX. A custom HOA website provides home owner associations a branded web presence in a highly competitive space. For great custom HOA web design and online branding call the web design experts at VISIONEFX. We build web designs for associations. We are the experts in ‘Homeowners association websites’. VISIONEFX is a web design agency located in Virginia. We provide custom web site services to small business throughout the USA. For more information about Home Owners Association website design call VISONEFX at (757) 619-6456 or email direct to info@visionefx.net. See our Top Google Reviews posted on Google My Business pages. Read our review and contact our website customers and learn why our web maintenance services are second to none.